Key operational metrics right in your WordPress dashboard. You have THREE full tabs of options available! Of course you would want to be able to control the placement, layout, maybe decide if a widget can be viewed. We provide options to permanently disable each widget. And, to temporarily disable any one or more of them WordPress makes this easy for – you can use the normal WordPress Admin controls to add or remove widgets as well as move them around to create a layout that works for you! And, the data shown to agents generally correspond to the access they are granted to tickets. 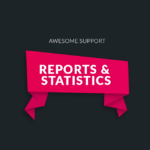 So start making smarter data driven decisions about your support operations today – get the Awesome Support Report Widgets add-on! IMPORTANT: Please read the upgrade notes about this new version if you are already using version 1.0. Read the upgrade notes here. Fix: Many widgets weren't being restricted by agents when a standard agent was logged in. Fix: The count for open tickets was wrong because it was using the last modified time of the ticket instead of the date the ticket post was created/published. Fix: Open tickets chart was not passing a chart title. Fix: Default data point width was not being read properly. ENH: Added settings tab - control which widgets are enabled (and therefore consume CPU resources when viewing the dashboard). ENH: Added new chart reports - summary charts for PRODUCT, PRIORITY, DEPARTMENT, AGENT, STATUS. Each report has about a dozen options to control the look of the widget. Tweak: Split the configuration tab into 3 new tabs in order to make all the options manageable. Tweak: Do not show statuses with zero open ticket count in the OPEN TICKETS BY STATUS text widget. Zero-counts just takes up precious real-estate. Fix: Return the product name even if product syncing is turned on. Apparently get_term doesn't do that so have to use get_term_by_id.